Welcome to the official website for NekoNeko Maid and Host Club! This is your Cute Maid Leader Miki and I'll also be your Web Mistress while you browse our site! Feel free to take a look around! And if you're interested in auditioning, we can't wait to see you! Hello again, everyone! Winter has finally ended here at NekoNeko Maid and Host Club! Be sure to check out our events page to see where we're heading this year~! You can buy pre-sale tickets for both A-kon and Comicpalooza~! Merry Christmas!!! We hope you have a wonderful holiday!!! To help celebrate the coming year, Neko Neko now has an online store! Feel free to browse as much as you like and consider helping out your favorite maids and hosts! As you can see, the site got a winter-y make-over!! Also, the event page is updated with all of our past events~! Look forward to seeing us next year!! Hey hey~! Just a quick update! You can now purchase a pre-sale con pass for Sonic Con! Yayay! 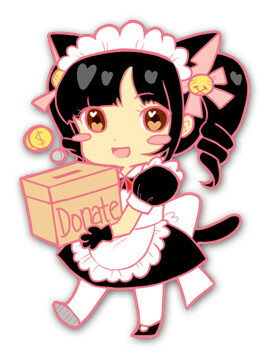 Also, you can now donate to any Neko Neko Maid or Host who has a profile page! So if you have someone specific you'd like to see, donate a little bit to help them out!! Hi hi~! So I'm currently updating some of our maids/hosts profile pages~! Those that are updated are Haku, Yumi, Mireai, Mitsuki, Botan, Aiko, and Cass-chan! So check out their profiles and learn about your favorite maids~! Wanna see us elsewhere on the net? © NekoNeko Maid and Host Club 2009-2014.